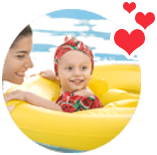 Swim lessons loved by Aliso Viejo families for over 15 years. of water safety and are uniquely designed to be fun and build confidence both in and out of the water. Premier is home to 2 swimming pools, a splash pad, and a jacuzzi. Parents & guardians enjoy the options of getting in the water with their children or relaxing in the sun or a cabana. Why Do Families Choose Premier? One-of-a-kind skill & confidence building curriculum. Providing lifeguarding services to Orange County communities. Our Lifeguards are trained and retested on lifesaving fundamentals every day. We practice water safety first and have a proactive, not reactive, approach to safety around the water. Premier lifeguards service aquatic facilities and swimming pools at over 40 locations throughout Orange County. We personally train our lifeguards.